Staying with Ryan… he has recently contributed imagery to an engaging project run by friends of the course graphicdesignand. This organisation, run by Lucienne Roberts and Rebecca Wright, looks at the ways in which graphics interacts and overlaps with other wider fields within society. 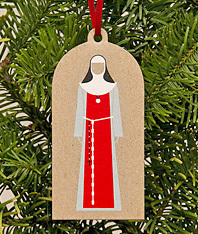 A Xmas goodie of theirs was this set of Xmas tree decorations depicting the habits of different religious orders using Ryan’s austere and beautiful pictograms.